Strategic bombing was one of the most controversial aspects of the Second World War, from both a military and moral perspective. Beginning with the Italian Giulio Douhet in 1921 (Command of the Air), the possibility that a nation could be defeated solely by air attacks on its economic infrastructure was studied extensively by air power advocates. The U.S. Air Corps Tactical School closely studied Douhet, and Brigadier General Billy Mitchell embraced the concept of strategic bombing after touring the Far East in 1923-1924 and concluding that Japanese cities were "highly inflammable." However, the views of the "bomber cult" that grew up around Mitchell clashed with those of the Army General Staff, which believed that the proper role of air power was to support surface forces through reconnaissance and direct ground support. Mitchell became so vituperative in his attacks on the views of the General Staff that he was court-martialed for insubordination in October 1925. A month later, the Morrow Board concluded that establishment of an independent air force would be premature given the contemporary limitations on bomber range. Mitchell then appealed directly to the public, arguing in his book Skyways (1930) against the Clausewitzian doctrine that the proper objective of war was the destruction of the enemy army. Mitchell argued that air power could bypass the enemy army and strike directly at the enemy's "vital centers," destroying his capacity to make war and forcing him to capitulate. However, many civilian leaders had serious moral qualms about the collateral damage to noncombatants that would be inevitable in a strategic bombing campaign. Indiscriminate attacks on civilians were generally considered a violation of the customs of war, though the legal status of attacks on cities containing military facilities or war industries was unclear. The Hague Conventions banned bombs and projectiles dropped from balloons, but were never updated to include attacks from heavier-than-air aircraft. Mitchell was unable to turn public opinion before his death in 1936. However, the concept of an independent air force organized for strategic bombing held considerable appeal to airmen. The activation of of General Headquarters Air Force on 1 March 1935 and the first test flights of the B-17 Flying Fortress later that summer were the first steps in what became a steady march. The creation of the Axis in 1937 led to Roosevelt's call for a massive buildup in air power on 12 January 1939. Both airmen and Winston Churchill viewed the Munich pact of 29 September 1938 as blackmail driven by the threat of German air power. There remained the question of the appropriate targets for strategic bombing. Advocates of precision bombing argued that bombers should target key industries and infrastructure whose destruction would cripple the enemy's warmaking capacity. In contrast to this surgical approach, advocates of "morale bombing" argued that area bombing of population centers would rapidly destroy civilian morale and create irresistible political pressure for a capitulation. When the ACTS published Employment of Combined Air Force in 1926, the enemy population was included with critical industries and the enemy air force as one of the principle objectives of a strategic bombing campaign. Just how the people of a totalitarian state at war would exert such pressure remained unexplained. However, those Air Force leader most attuned to public opinion, such as Hap Arnold, seized on precision bombing as a way to defuse the moral objections: Precision bombing held out the promise of destroying a nation's warmaking capacity without killing large numbers of women and children. However, even the advocates of precision bombing tended to view it in terms of its adverse effect on civilian morale. The debates over air power in the United States were paralleled by similar debates in all the other major powers. However, airmen in Britain, France, Germany, and Italy were able to establish independent air forces, while the air forces of the United States remained nominally under Army and Navy control. The Japanese Army and Navy retained tight control over their respective air arms, though both services developed long-range bombers. The "bomber cult" of the British Royal Air Force was as powerful as that of the U.S. Army Air Force, but the airmen of the other powers were less successful in resisting pressure to devote most of their resources to ground support. Some idea of the dogmatism of Britain's "bomber cult" can be gleaned from Cunningham's recollection that "Bomber Harris complained what a nuisance this Overlord operation was and how it interfered with the right way to defeat Germany, i.e. by bombing" (Roberts 2011). When war broke out, the first experiments in strategic bombing were carried out by the Axis against weaker powers that had no capacity to retaliate. Japan engaged in indiscriminate bombing in China (particularly of Chungking), and Germany carried out bombings of Warsaw in Poland and Rotterdam in the Netherlands that were highly questionable from a military or economic warfare perspective. Initially, the Allies avoided strategic bombing. There is a famous anecdote that Chamberlain, Churchill's predecessor as Prime Minister of the United Kingdom, refused to give his air commanders permission to bomb the German arms factories in the Ruhr on the grounds that they were private property. Long-range bombing was limited to obvious military targets, such as the naval base at Wilhemshaven. This changed during the Battle of Britain. A German bomber flight became lost and jettisoned its bombs, as it turned out, over the East End of London. Britain retaliated with a bombing raid against Berlin that came nowhere near the city center (night aerial navigation being very primitive) but infuriated the Nazi leadership. This led to the "Blitz" against British cities, in which tens of thousands of civilians were killed and many more left homeless. At this point, moral qualms were largely abandoned in favor of an "if that's how they want to play the game ..." attitude. Allied leaders such as Sir Arthur Harris of Bomber Command voiced the opinion that the Axis, having sown the wind, were entitled to reap the whirlwind. Roosevelt also voiced this sentiment, stating that he wanted the Axis bombed "heavily and relentlessly ... they have asked for it and they are going to get it" (Wolk 2010). The military effectiveness of strategic bombing in Europe is as controversial as its morality. German production actually increased during the peak of the strategic bombing campaign, though most of the increased production was in occupied countries out of range of Allied bombers. The morale of the German people never cracked under bombardment, contrary to the expectations of Allied air commanders. Bomber casualties were heavy. This was particularly true among American bomber crews, since the Americans grossly overestimated the survivability of their strategic bombers on daylight raids. Ironically, the decision to risk heavy casualties in daylight bombing was based on a belief in precision bombing, which specifically targeted factories and communications rather than civilians. British bombers were employed for area bombing at night, but also began to suffer serious casualties as German night fighter defenses improved. It took some time to accept the dictum laid down decades earlier by Mitchell, that air superiority was a sine qua non for a strategic bombing campaign. Doolittle seems to have been one of the earliest of American bomber commanders to accept this fact. Once long-range fighters began escorting American bombers, casualties soared among the defending German fighter pilots. This was a major contributing factor to the collapse of the Luftwaffe in the West and the success of the Anglo-American invasion of France. When the Allies finally focused their strategic bombing on synthetic fuel plants and other petroleum facilities, early in 1945, the Germans quickly ran out of fuel. This was an important contributing factor to the collapse of the Wehrmacht. However, the Russian capture of the oilfields in Romania and Austria were probably as important as the strategic bombing campaign. [The Japanese] have in large number of instances resorted to bombing and machine-gunning of civilians from the air at places near which there were no military establishments or organizations. Furthermore, the use of incendiary bombs has inflicted appalling losses on civilian populations. Japanese air attacks in many instances have been of a nature and apparent plan which can be comprehended only as constituting deliberate attempts to terrorize unarmed populations. As early as November 1940, Chennault (then an advisor to the Chinese government) urged the use of the same tactics against the Japanese to "burn out the industrial heart of the Empire with firebomb attacks on the teeming bamboo ant heaps of Honshu and Kyushu." However, after war broke out in the Pacific and the American Volunteer Group began operating in China, Japanese strategic bombing came virtually to a halt. The Americans began the war with the B-17 Flying Fortress, arguably the world's first true strategic bomber. Both the B-17 and its successor, the B-24 Liberator, were used extensively for patrolling and tactical bombing in the Pacific. Neither had the range to reach important strategic targets deep in the Japanese Empire. However, this picture began to change on 15 June 1944, when the first B-29 Superfortress raid reached Kyushu from 20 Air Force bases in China. At first, the Superfortresses carried out daylight precision bombing raids, but these were disappointing. Logistics were nearly unmanageable, requiring seven B-29 flights loaded with gasoline from India to supply each combat sortie. Japanese agents in China gave hours of warning of every raid. High-altitude flying conditions over Japan were miserable due to the proximity of the jet stream. In addition, Japan is frequently cloud-covered, and the Allies started with meager intelligence on most targets. From the period between June 1944 and April 1945, 20 Bomber Command in India and China launched 49 missions, of which just nine were directed against the Japanese home islands. The first such mission left India on 13 June 1944 with 92 B-29s, of which 12 were forced to abort and one was lost in the flight to Chengtu. 68 of these were able to take off the next day for Kyushu, but one crashed on takeoff and only 47 actually reached the Imperial Iron and Steel Works at Yawata. Night conditions and poor weather meant most of the aircraft bombed by radar; of 221 tons of bombs dropped, just one hit the target. One bomber was shot down and another six others were lost in accidents. The commander of 20 Bomber Command, Kenneth Wolfe, was kicked upstairs and, on 29 August 1944, Curtis LeMay took command in his place. However, the difficulties of attacking Japan from China were simply too great. The nine missions flown against Japan cost 125 B-29s, of which 29 were lost to enemy action. The only significant damage was to the small Omura naval air arsenal. With the capture of the larger Mariana Islands, the U.S. strategic air forces were able to establish airfields that had an adequate line of supply and from which the B-29s could reach most of Japan. The results of high-altitude daylight precision bombing continued to disappoint, however. The first raid on the Tokyo area, on 24 November 1944, hit the Musashino aircraft plant with just 48 out of 240 bombs dropped. Two B-29s and five Japanese interceptors were lost. Once again, the commander of 21 Bomber Command, "Possum" Hansell, was relieved by LeMay. LeMay initially had no better success, and, under intense pressure from Arnold, he switched to night area bombing using incendiaries. By bombing at night, the B-29s could fly at lower altitude and with less defensive armament, allowing more incendiaries to be carried to the targets. The incendiaries themselves were more potent than ever, containing a combination of napalm and magnesium. The risk was that the bombers would be highly vulnerable to light antiaircraft fire, but LeMay gambled correctly that this would be very weak. The first raid using the new tactics, against Tokyo on the night of 9-10 March 1945, involved 279 B-29s dropping over 1650 tons of incendiaries. It was a windy night, and wind gusts of up to 70 miles per hour (110 km/h) fanned the flames beyond all possibility of control. Witnesses later claimed that the fires were hot enough to boil the water in the city's canals. The death toll was somewhere between 80,000 and 120,000 persons. This was probably the most devastating single air raid of the war, exceeding even the nuclear raids. From then on, the U.S. strategic air forces began systematically burning the cities of Japan to the ground. Japanese defenses were pitifully inadequate and civil defense was rudimentary. Tokyo had just 18 concrete air raid shelters with a combined capacity of 5,000 persons. The coastal plains on which most of Japan's cities were built were composed of unstable soil derived from volcanic ash, which hindered excavation. The only shelter for most civilians was bokugo, small holes six to 15 feet (two to five meters) long, three feet (one meter) across, and four to six feet (1.5 to 2 meters) deep, with bamboo roofs covered with a thin layer of dirt. These were dug next to homes or along streets, and proved almost useless. 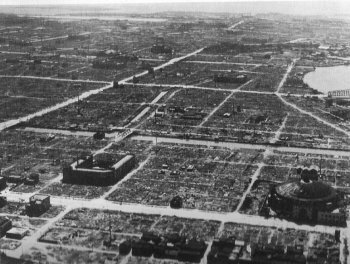 Tokyo authorities had ordered the demolition of some 207,370 homes to produce 31 miles of firebreaks by March 1944, but in many cases the timber from the demolished homes had not yet been removed. We were going after military targets. No point in slaughtering civilians for the mere sake of slaughter. Of course there is a pretty thin veneer in Japan, but the veneer was there. It was their system of dispersal of industry.... I'll never forget Yokohama. That was what impressed me: drill presses. There they were, like a forest of scorched trees and stumps, growing up throughout the residential area. Flimsy construction all gone ... everything burned down, or up, and drill presses standing like skeletons. Standing in the ashes of a substantial portion of the burned homes [in Tokyo] are various types of machine tools like lathes, drill presses, etc. Here family groups were manufacturing repetitive parts like nuts, bolts, or coils which were delivered to the manufacturing centers for use in the assembly of military weapons. In the area we examined, approximately one fifth of the homes showed evidence of such activities. It became apparent in March 1945 that Japan could not win the war when the B-20s wrought extensive damage, especially in the case of small factories scattered throughout the cities. The fire bomb raids destroyed most of the smaller factories making aircraft parts, thus causing serious losses in production. The many small plants scattered over the cities which were destroyed caused serious loss in other material and general production. Aircraft engine production always lagged behind a safe ratio to airframe production and was frequently numerically inferior for individual types. Another factor underlying LeMay's departure from the previous American insistence on precision daylight bombing was the mass suicides of civilians on Saipian, which suggested to some that there was no meaningful distinction between Japanese combatants and noncombatants. Arnold and LeMay were also under pressure from Roosevelt, who was a strong supporter of strategic bombing and seems never to have expressed any serious qualms about area bombing of Japanese cities. Later in the campaign, leaflets would be dropped a day or two in advance of a raid, announcing the next target and admonishing civilians to flee to the countryside. It is unlikely this was motivated primarily by humanitarians concerns. It was more likely a form of psychological warfare, demonstrating to Japanese civilians that their government was powerless to protect them even when raids were announced well in advance. There is some evidence that this form of psychological warfare was highly effective. Total casualties and damage from the strategic bombing campaign are give in the table below (Frank 1999). A different form of strategic bombing was aerial offensive mine laying. These missions were inexpensive and very effective at shutting down Japanese coastal shipping. Aerial mine laying by Superfortresses began with Operation Starvation, which laid 900 mines in April 1945. Shimonoseki Strait was shut down for two weeks and total Japanese imports dropped by half. Desperate Japanese commanders ordered ships to run the strait anyway, resulting in heavy shipping losses. By the end of the war, the Superfortresses had laid 12,000 mines and were responsible for 63% of all shipping losses suffered by the Japanese during the period of the mining campaign. The mine campaign is summarized in the table below (Frank 1999). Also of strategic importance was the sinking by carrier aircraft on 14-15 July 1945 of eight of the twelve railway ferries that carried traffic between Hokkaido and Honshu. This immediately halved deliveries of coal to Honshu. The ultimate expression of strategic bombing were the nuclear attacks on Hiroshima and Nagasaki. The importance of these raids in forcing the Japanese to surrender has been questioned, but they were likely a major factor (along with the sea blockade and the Russian invasion of Manchuria) in the Emperor's final decision. The total tonnage of bombs dropped on Japan was 160,800 tons out of a total of 656,400 tons dropped in the Pacific War. By contrast, Germany was hit by 1,360,000 tons of bombs out of 2,700,000 tons of bombs dropped in the European theater. This tends to confirm the idea that Japanese cities were particularly vulnerable to fire bombing, and stands in contrast with a wartime estimate that 1,620,000 tons of bombs would be enough to knock Japan out of the war. However, the overall effects of the strategic bombing campaign are disputed. Industrial productivity in most categories was reduced to about half its 1944 peak by July 1945. Aluminum production had come to a near standstill at 9% of its 1944 peak. However, the massive drop in productivity likely owes at least as much to the destruction of the Japanese merchant marine, and the resulting loss of imports of raw materials, as to the destruction of the factories themselves. Had the war continued past August 1945, the next target for strategic bombing was to be Japan's rail system. Because of Japan's mountainous terrain, the rail system was unusually vulnerable to attack, which would have made it impossible to move vital commodities such as rice. Frank (1999) has argued that this would have led to widespread famine that would have forced a surrender without the nuclear attacks, but at the cost of perhaps as many as ten million deaths by starvation. As it was, disastrous declines in rice production coupled with blockade meant that the occupation authorities had to import 800,000 tons of food in 1946.